In the second part I described the initial configuration wizard of the first and following PVS server. Now both servers have executed this initial wizard we are ready to do the preparations for creating the vDisk, which we will do in this part including using the vDisk by other Target Devices. 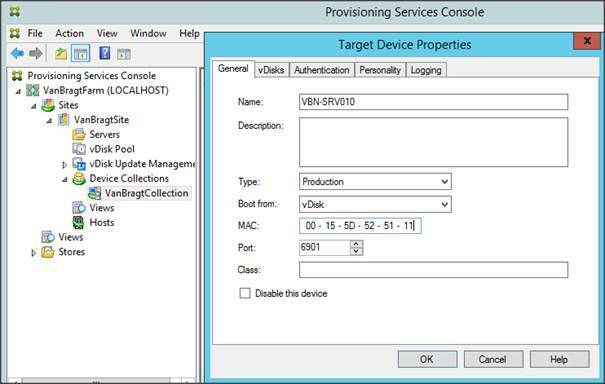 After the initial configuration in part two the PVS infrastructure is now ready for use. To show the complete workflow I will now continue with the steps on the Master Target Device to create a vDisk. We already installed the Target Device software in part one. 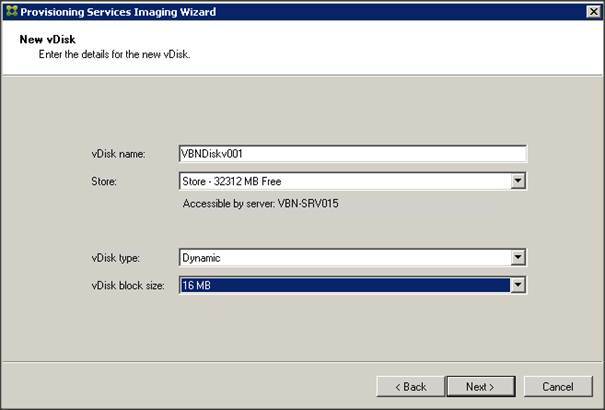 For creating the vDisk we need to start the Image Wizard (which can be started directly after the installation or out of the Start Menu). The Image Wizard starts with a welcome screen. The first information we need to provide is the name or IP address of one of the PVS server to contact the PVS infrastructure. 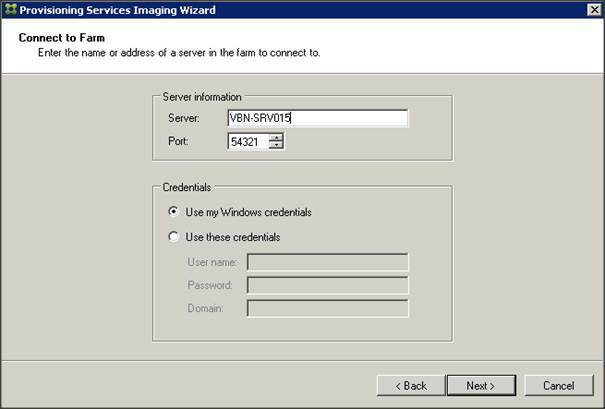 If you are logged in with limited credentials you also provide other credentials with PVS administrator rights. 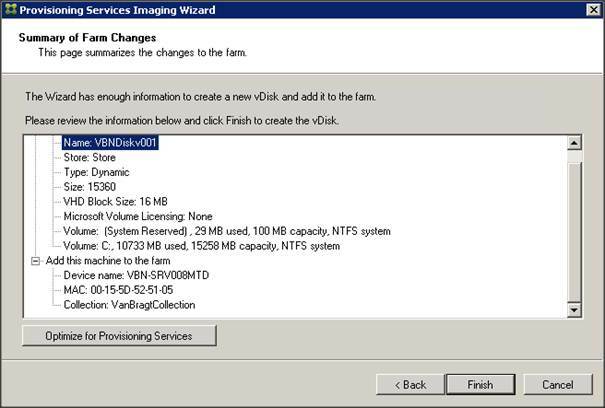 It’s possible to create the vDisk in advance using the PVS management console, but this can also be done via the Image Wizard. If you already have a vDisk available you can select it here, otherwise you choose Create new vDisk. The new vDisk requires a unique name. 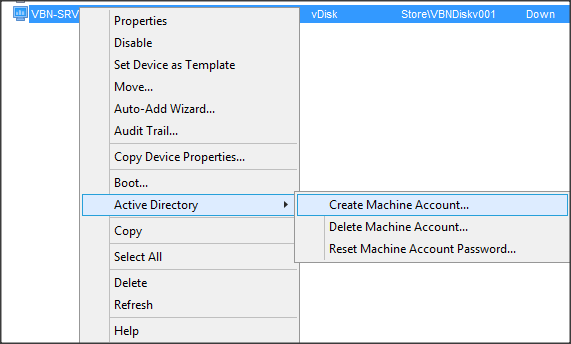 When you have more stores available you also need to select the store where the vDisk should be created. At last you need to select whether to use a fixed or dynamic disk. Nowadays I recommend using a dynamic disk as test results show that there is no performance difference (anymore) between the two types and dynamic requires less disk space. When choosing Dynamic you also need to provide the block size the vDisk grows, I always choose 16 MB. The next question is about Microsoft Volume licensing. 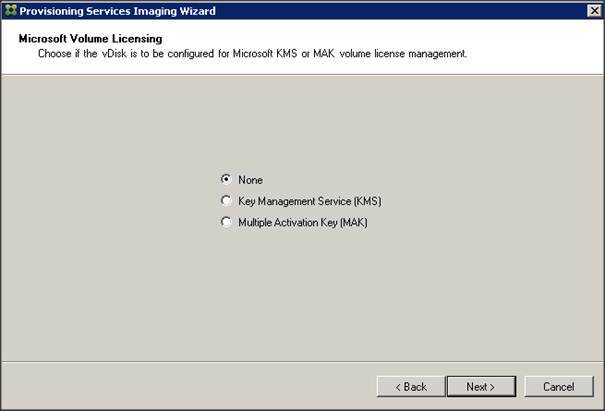 I recommend checking the excellent article Enabling KMS Licensing on a vDisk by Ingmar Verheij when you are using KMS. Choose which system you are using in your organization. 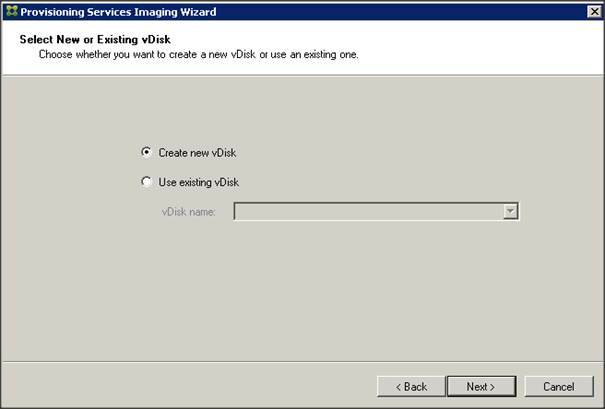 In the following screen you need to specify which disk you want to have in the vDisk. It’s possible to select multiple partions if that’s required (for example when you install all applications on a separate partition). Logically the drive with the operating system installed should always be selected. You can also tweak the size of the vDisk within this part of the wizard. Logically the machine should be part of the PVS infrastructure. Therefore the machine should be provided with a Target Device Name. It’s important to provide a different name than the actual computer name (in Active Directory). I normally just add MTD, but you can use any name. Also the network card should be selected and a Device Collection where the machine will be added to. I recommend creating a separate Device Collection for machines used as Master Target Device. The wizard is almost finished now. A summary is shown of the provided settings. 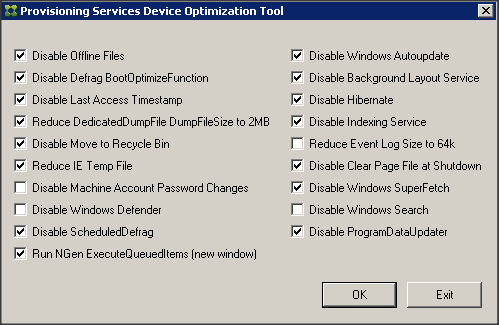 Within this display there is a button called Optimize for Provisioning Services. Within this button several settings are available for tweaking the imaging. Be careful about accepting all values by default. Check the organization security requirements for example. A good one is Windows Search. If you are running Outlook, Windows Search is used for searching e-mails within Outlook. You understand it would not be smart to disable the Windows Search in the image. After the optimization phase we can end the wizard using the Finish button. After pressing the Finish button the actions are executed like creating the vDisk and creating the device within the PVS infrastructure. When that part is finished it’s time to restart the machine to start the actual imaging process. 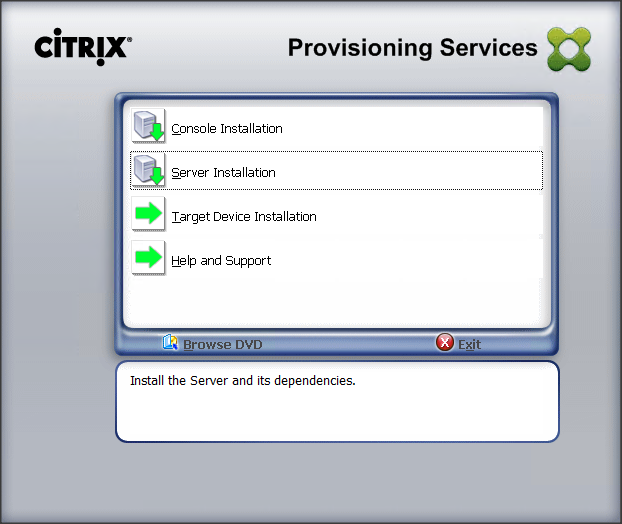 Remember that at this phase the machine should connect to the PVS infrastructure using the PXE or BDM option. Afterwards the machine is connected to the PVS infrastructure using PXE or BDM and is fully booted again. We can logon again and the image wizard will be started automatically, showing the progress bar. 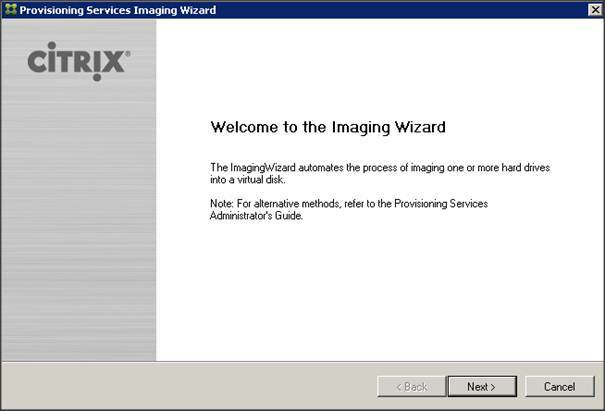 When the imaging process is done a screen is shown that the conversion is completed. The machine will show its normal interface, you will also see an additional disk connected to the system. But logically that’s not necessary. The next step is to shut down the machine, so the disk image is not in use anymore. The next step is executed in the console. It’s time to change the vDisk from the private (so it can be written) to shared mode (so the vDisk can be used by multiple Target Devices). This is done by selecting properties of the just created vDisk at the vDisk pool within the site. Here you need to change the access mode from private to standard and select the location where you would like to store the Write Cache. It’s a step to far to explain the different options with their characteristics. Please check my articles series about Designing PVS on my personal website. More settings can be changed, but for simplicity I only show the required changes for now. 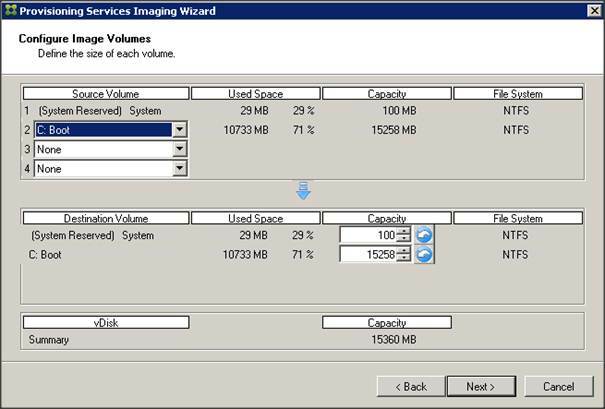 When the vDisk is reconfigured we can start machines using the vDisk for OS streaming. Therefore the machine needs to be known within the PVS infrastructure. This is done within a Device Collection by selecting New Device. You need to provide a name (this will be the name of the computer when booted) and the MAC address. For now configure Type: Production and Boot From: vDisk. I will discuss the Type later in this article series. 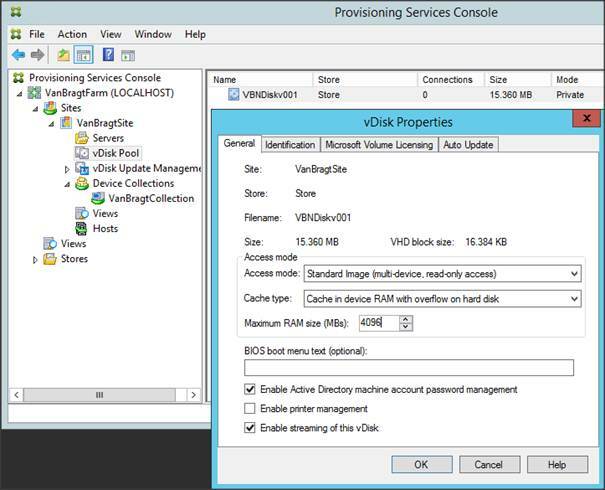 Also you need to assign the vDisk to the device within the vDisk tab. When the Target Device is created, we need to do one more step and that is creating the machine account in AD (so the machine is able to use the domain). 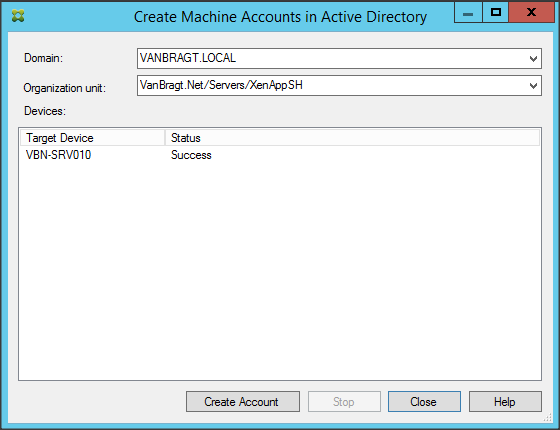 Select the Target Device, right click the mouse button and select the option Active Directory – Create Machine Account. In the next screen you can specify in which OU the account should be placed and the machine account will actually be created. This is executed under the account which is logged into the console, so be sure that the account has the required privileges to create machine accounts. Now we are ready to start the machine, connect to the PVS infrastructure (via PXE or BDM) and the operating system is streamed to the device. The boot process will look like a normal machine and you can log in with a domain account. 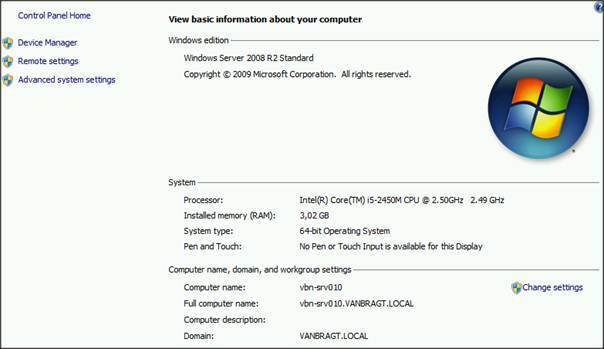 The machine will show in the properties the name provided within the PVS console joined in the domain. Now we have a machine running on the vDisk provided by the PVS infrastructure. From now you can add more target devices and boot those from the same vDisk. 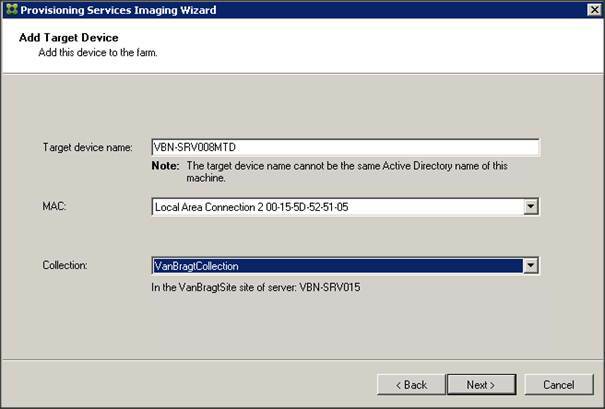 In this article we created a vDisk using a Master Target Device. After creating the vDisk we configured the disk in the standard mode. Next we created a Target Device and added that one to the Active Directory. As the last step we booted the Target Device and streamed the OS to this machine. In the upcoming and last article I will discuss some advanced configurations and the vDisk update possibilities.